Sometimes, it's a good thing to live in a rugged state like Colorado and not have one of those monstrous SUVs. Our little ten-year-old Honda CRV has AWD and does reasonably well on the mountain roads but when a dirt road suddenly dissolves into a stream with a sandy bed? Well, there is usually only one thing to do: back up, park on the side of the road in a designated spot and hike the rest of the way to the trailhead on a trail lined with surprises. Sometimes, it's a good thing to have a husband who is a waterholic. It means going off-trail before the hike, during the hike and after the hike. I've learned to go with the flow - not literally, of course - because it leads to discoveries of bullet-ridden metal, twisted and rusting. Sometimes, it's a good thing to have an out-of-state visitor. We are out of the house by 7:30am on a Saturday morning, on our way to Indian Peaks Wilderness to show off one of the most beautiful areas in our region. It usually translates into a moderately easy hike; Lost Lake, 4 miles round trip from the side-of-the-road parking spot, 10% grade, incredible views of the Continental Divide. If you are wondering about that last one like our visitor did, I'm pretty sure that the hiker didn't hobble along the trail, not noticing that he had lost a shoe. It was probably an extra sandal that dropped off his backpack as he made his way back to his car after camping in the backcountry around Lost Lake. Whatever the reason, it was enough cause for a good giggle before heading further up the trail. The hike was steep in parts and meandered in other parts, but mostly rocky all the way through. That took its toll on my ankles and back, rendering me almost useless on Sunday. It was a treat therefore to dig into my refrigerator and find a small pot of homestyle palak paneer. Simple pleasure personified. Palak paneer reminds me of a recent encounter with a rather indignant local restaurateur. We had gathered with Francie's family in the last week of July to eat at her favorite Indian restaurant in Boulder when her mother asked for palak paneer. "Palak," he explained, "is spinach. Our entrée is called saag paneer as it contains broccoli greens as well as spinach. Saag is the word for greens in our language. Calling it palak would be incorrect!" Needless to say, he was from The Punjab, brought up in The Canada, now settled in The Colorado. I giggled as my thoughts immediately wandered to a Delhi resident who speaks equally indignantly about this saagsaga. He did have a point! He also had a lot of cream in his saag paneer which, as some of you might already know, does not find its way into the every day homestyle palak paneer. Additionally, the spinach in the restaurant-style saag paneer in the US is chopped fine and not puréed, coarse or fine. Most cooks like to blanch their spinach and then squeeze out the excess water. Not me; I don't blanch my spinach nor do I lose any precious nutrients by squeezing the leaves dry. Instead, I use baby spinach and walk the easier route. Add grated ginger and green chillies and stir-fry for a couple of minutes on medium heat. Add baby spinach and allow it to just wilt, stirring every so often. Take the kadhai off the stove. While this is cooling, dice the paneer into small bite-size pieces. Spray with cooking oil and toss so that every piece is reasonably coated. Line a baking tray or cookie sheet with foil and place diced paneer on it. Broil for 2-3 minutes on high, toss, broil for another couple of minutes until most of the pieces are golden and slightly crisp. Purée the spinach mixture in your blender, adding water only if needed. Pour this back into the kadhai and bring it back to a simmer. Add salt and lemon juice and stir to mix well. Add the paneer pieces, reserving some for garnish if you like. Heat through and serve immediately with rotis or steamed rice. Palak paneer is best without too many spices and herbs. I like mine very simple: no onions, no tomatoes, no garlic. The flavor rides on spinach, green chillies and ginger. Don't worry if you end up with a slightly runny sauce. Any extra liquid in the spinach purée will absorbed by the paneer as it sits in it. Do not overcook the spinach beyond the wilting stage as this helps it hold its beautiful green color and preserves the taste. Use fewer green chillies to make it less hot. I've read innumerable complaints about store-bought paneer. I buy the Nanak brand and have not had any issues with it. The funny thing is that even though I love the variety of the Indian cuisine, in 80% of the cases that I go out eating Indian I end up with ordering palak paneer. Being a vegetable-and-dairy junkie and non-meat eater, plus not too keen on lentils, it's just the perfect Indian dish for me. Yours looks scrumptious. I hope your back and ankles are better again. Gorgeous pictures. I love wonderful sweet nature. That's great! We never saw the car when we were there a couple of weeks ago. Then again, we didn't even make it all the way tot he lake. It was so hot! And that rocky trail was treacherous. Your pictures are great. I need to try making your paneer sometime. such breathtaking pics! and the paneer looks sooo yum. finger-lickin good I say! Lovely clicks Manisha! Palak paneer looks very yummy. Gorgeous photos. And that palak paneer is calling my name. One of my favorite classic dishes. I just found your blog. 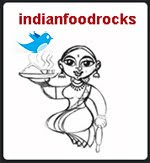 I have recently been reading "Indian" cookbooks and have tried one or two things such as "Balti" chicken. Don't know if it's an authentic recipe or not but it was delicious. I live way up in the mountains near the Flattop Wilderness area and there are no Indian restaurants around here! Is there any way you could recommend a really good Indian restaurant in Denver or Boulder or anywhere in Colorado? Also, a good place to buy Indian ingredients? I will continue to read your blog and learn from you, thank you so much. Your palak paneer looks delicious. I love paneer, but we usually prepare more simply...or put it in potato curry. Gabi, thanks! This dish rides on simple flavors and which can be made bolder depending on your mood. So it's quite versatile, too! Priya, thank you! Do you like to hike? Kitt, did you drive through the stream to get to the trailhead? This truck is between the stream and the signpost for Hesse Township. And, it's not visible from the trail but is before the pond if you're walking to the trailhead. Neha, thanks! I love that I don't have to blanch the spinach or use baking soda for color. Tasty, thanks! Hope you like it! caterina, I like to think of Balti as Indian-inspired British curry. I haven't dabbled in it myself but am curious to know if you liked it. There aren't many Indian restaurants around here either! I recommend Taj III on S Boulder Rd in Louisville because the quality of their food is consistent and the people are very nice. Tibet's, also in Louisville, is great for yak meat in Tibetan noodle dishes like thukpa and my family likes their cream-laden saag paneer - again, very nice people! Several friends have recommended India's Pearl in Denver but I have not had the chance to go there yet. These restaurants serve North Indian fare. You can get idlis and dosas at Masalaa in Aurora. There is a newer restaurant called Jai Ho, also in Aurora, that serves idlis and dosas but reports have been on either side of the spectrum. I'd recommend you avoid the buffet and go for dinner, no matter which restaurant you choose. I buy my groceries from Krishna's in Lafayette. There are a few Indian grocers in Boulder but I never shop there. Several friends recommend My India's in Broomfield. I haven't been there yet. I supplement with fresh veggies from Pacific Ocean Market and H-Mart (eat dosas at Masalaa and then shop at Bombay Bazaar next door and then head over to H-Mart for fresh veggies). I hope this helps! Indie.Tea, simpler than this? Please share! There HAS to be a story behind that rusty, abandoned vehicle! And the one shoe? Sometimes I'll see one lone shoe sitting by the side of the road and I always wonder what the tale behind it is. Cream in saag (er, excuse me, palak) paneer=ick. Yours looks great. Loved the palak paneer, its looking awesome. This is by far my go-to recipe for Palak Paneer. Love the simplicity of the recipe, it truly makes you appreciate the earthy ingredients and allows you to taste each one individually and yet comes together and creates magic! This is my family's favorite Palak Paneer dish and I thank you for sharing it with us!